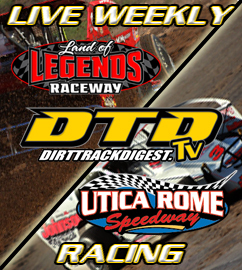 VERNON, NY- With Super DIRT Week XLVII just days away, that also means that the final event on the half-mile oval at Utica-Rome Speedway is upon us. This Tuesday, October 2, it will the return of the Super DIRT Week Pre-Game event that features the 100-lap $4,000 to win DIRTcar 358-Modified Series, the $3,000 to win Cole Cup for the 360 Sprints, plus the $1,000 to win DIRTcar Sportsman Fall Championship Series. Last year, this event saw some late race passes with a surprise winner in the 358-Modified main event that saw the two drivers that had dominated the Vernon oval for much of the past decade get passed for the win. After starting mid-pack and almost pulling off because he felt he wasn’t competitive, Mat Williamson came to life mid-way of the 100-lap DIRTcar 358-Modified feature and started picking cars off lap after lap. With about 10 laps to go, Williamson drove by both Stewart Friesen and Matt Sheppard for the big win. Friesen would try to retake the lead, but Williamson was too strong and would have to settle for second while Sheppard dropped out with mechanical issues. Erick Rudolph, Steve Bernard, and Chad Brachmann rounded out the top five. Another stellar field is expected this Tuesday as well as drivers will look to kick off their week with a big win. Last year’s version of the Cole Cup for the 360 Sprints, Jason Barney capped off his Lucas Oil Empire Super Sprint championship winning season by passing both Lucas Wolfe and Danny Varin with a handful of laps to go to score the $3,000 victory. Mike Mahaney finished off his late race charge to finish second followed by Wolfe, Varin, and Billy VanInwegen. The 360 Sprints always put on an exciting show at Utica-Rome and that should be expected this Tuesday as well. 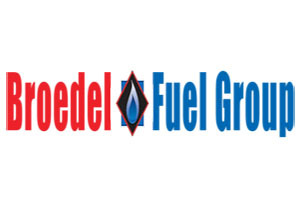 Many of the top 360 drivers in the region are expected to be in attendance. The $1,000 to win DIRTcar Sportsman Fall Championship will round out the evening’s action, again with the division’s top drivers in action. Last year, Glenn Forward took the victory ahead of Brent Joy, Kyle Inman, Rocco Leone, and AJ Filbeck. Gates will open at 4 p.m. this Tuesday with racing starting at 7 p.m. Grandstand admission will be $30 for adults with kids under 16 just $5. Students, Seniors, and Military pricing is set at $27. 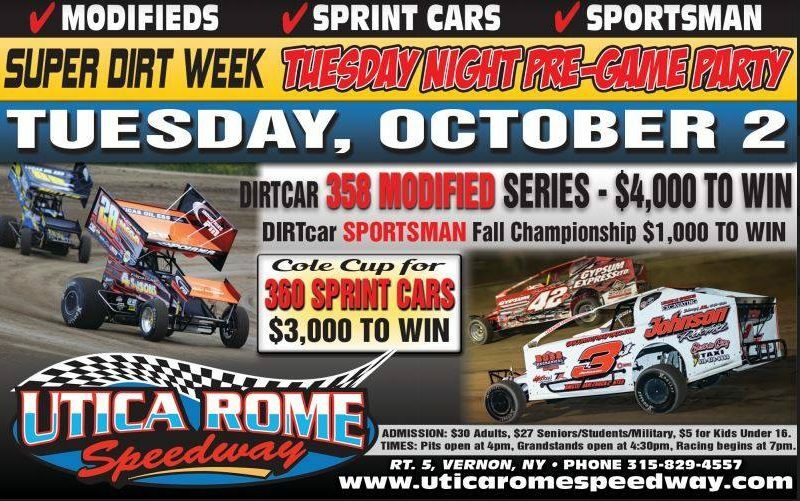 For more information, please log on to www.uticaromespeedway.com or visit us on Facebook or Twitter. The speedway office number is (315)829-4557.